Score, India 250-9 (1st innings), Cheteshwar Pujara 123, Mohammed Shami 6*; Josh Hazlewood 2/52, Nathan Lyon 2/83. Adelaide: Cheteshwar Pujara (123) was the star of Day one of the first Test between Australia and India as the latter finished at 250-9. Pujara was dismissed after bringing up his 16th Test century, his third against Australia and his first in the country. Earlier in the day, it was Rohit Sharma (37 runs) who got off to a good start but was dismissed by Nathan Lyon. Virat Kohli got off to a horrific start in the four-match series after he was dismissed by Pat Cummins as early as the 11th over. All the bowlers, including Josh Hazlewood and Mitchell Starc finished with two wickets. 100! Cheteshwar Pujara gets to his 16th Test century, 3rd against Australia, first in Australia. What an innings from @cheteshwar1. WICKET! Ishant Sharma is clean bowled by Mitchell Starc, dismissed for four runs. FIFTY! Cheteshwar Pujara gets to his 20th Test half century as India continue the fightback. India lost Rohit Sharma for 37 runs but Cheteshwar Pujara (46 not out) ensured that the visitors kept fighting as they headed for tea at 143-6. Pujara remains unbeaten with Ravichandran Ashwin (5 not out) at the other end. Both Nathan Lyon and Josh Hazlewood picked up a couple of wickets each as the second session too belonged to the hosts despite an Indian fightback. Rishabh Pant was also dismissed during the session as he was caught behind by Tim Paine off Lyon’s delivery. WICKET! Rishabh Pant is caught behind by Tim Paine as Nathan Lyon strikes once again. WICKET! Nathan Lyon sees off an in-form Rohit Sharma for 37 runs as Marcus Harris takes a comfortable catch at deep square. WICKET! Ajinkya Rahane is caught at second slip by Peter Handscomb as Josh Hazlewood completes the dismissal. WICKET! A huge moment in the Test match as Pat Cummins removes Virat Kohli for three runs courtesy a catch by Usman Khawaja at gully. WICKET! Murali Vijay is caught behind by Tim Paine as Mitchell Starc completes a soft dismissal. WICKET! Josh Hazlewood dismisses KL Rahul via a fuller delivery as Aaron Finch completes the dismissal. Visitors India had a forgettable start to their Test series against Australia on Thursday as they finished at 56-4 at lunch on Day 1 of the first Test here. While the openers KL Rahul (2) and Murali Vijay (11) failed to get the visitors to a strong start, it was not Virat Kohli’s day as he was dismissed for three runs by Pat Cummins. 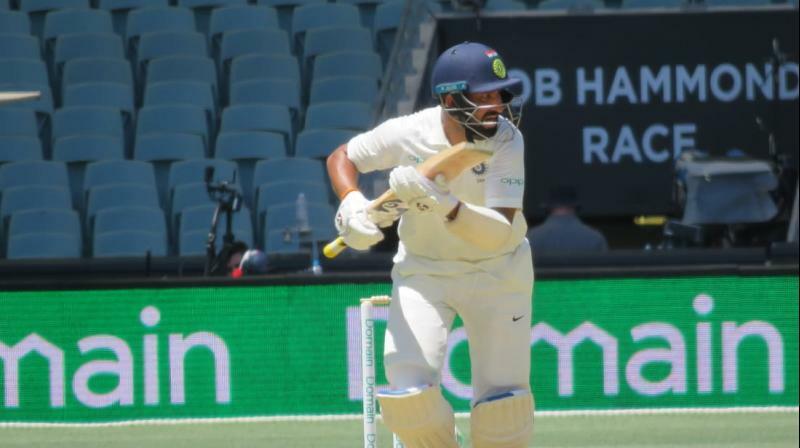 However, Rohit Sharma, who was selected over Hanuma Vihari has so far ensured a strong fightback by the tourists with Cheteshwar Pujara at the other end.